← What heritage are you leaving your children? Hey, I was here first! Who do these newcomers think they are, anyway? A couple of weeks ago my wife bought oranges at the store, which I cut in half and placed on our shrubs and in the maple tree just outside our kitchen window. 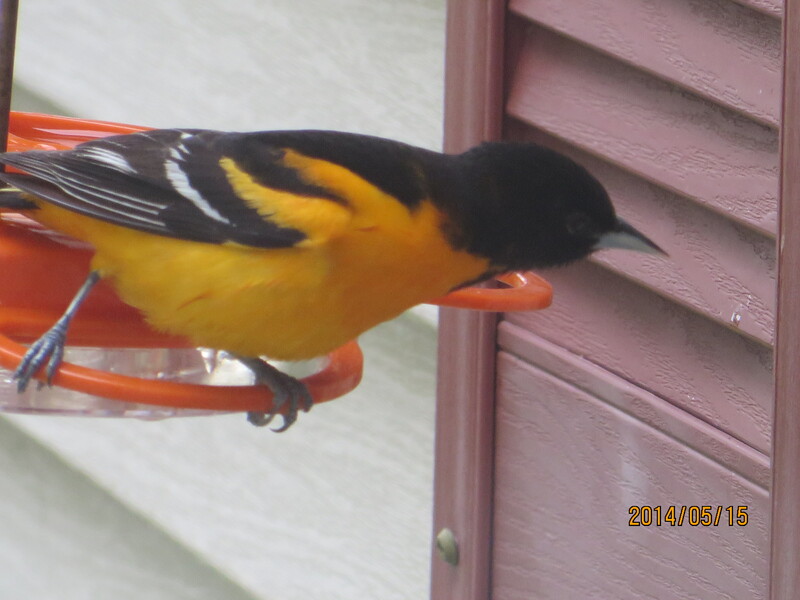 A few days later I hung the oriole feeder from a branch that extends to within fifteen feet of the house. A day or two after that, I cut another orange in half, scooped out the fruit and filled the half-circle of the peel with grape jelly and then set it on the windowsill. 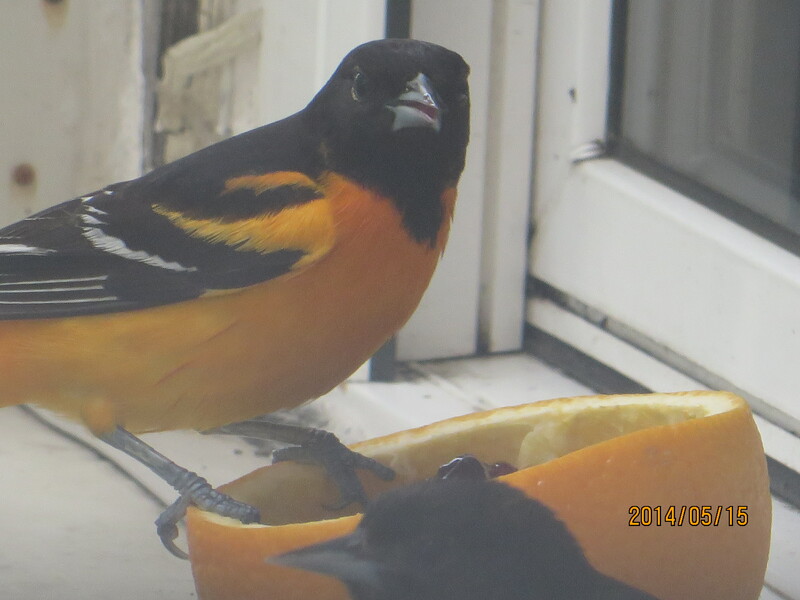 The next day the orioles arrived. 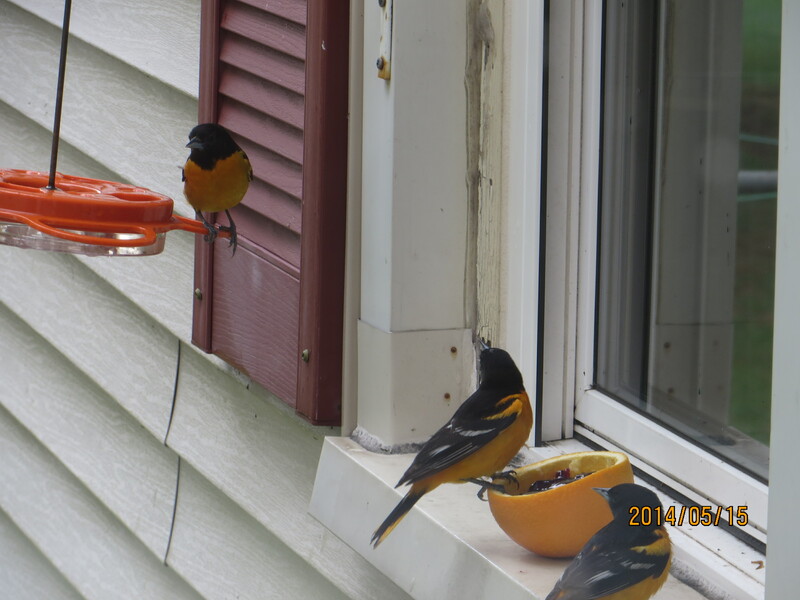 They sit on the feeder and nibble at the orange. They alight on the hummingbird feeder that hangs by the window and jump down onto the sill to eat the jelly. Sometimes there are three orioles on the windowsill at once, squawking angrily at one another, each impatient to take its turn. The hummingbirds have also returned. It takes a while for them to settle down enough to land on the feeder and drink the sugar water we’ve prepared. And even when they do, they never stop watching for the enemies (mostly other hummingbirds) that lie in wait to ambush them. I’ve seen two hummingbirds, facing each other, stationary in midair, like gunfighters on the street of some dusty Old West town, about to draw. 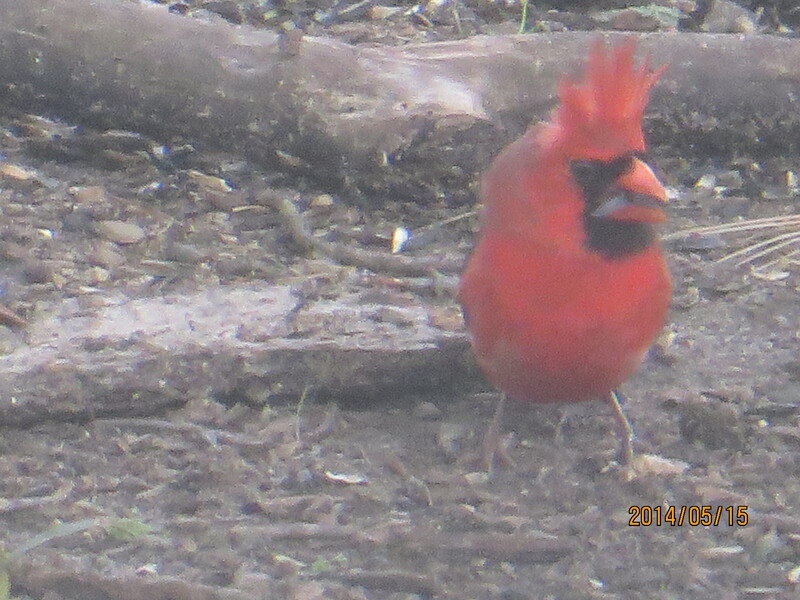 At times the birds will fly up to the feeder or to the windowsill and eat while we are standing just feet away. If the screen wasn’t in the window, and I was quick enough, I could reach out and grab them. Our kitchen sink sits under that window, so we are often standing there doing dishes when the birds fly up. For the most part, they ignore us. We can talk, laugh, even clatter dishes together and they pay no mind. But if they see us move, they’re off in a split second. Sometimes when one lands on the windowsill, I speak to him. “Hey, buddy: I’m the guy who puts the food out for you. I take care of you. What are you so worried about? Don’t fly away!” But he does anyway. I’ve been thinking that God’s relationship to people is a little like my relationship to those birds. He takes cares of us, provides for our needs and enjoys having us near. But we, like the orioles and hummingbirds, are rarely aware of his presence. If we do sense him getting close, we are more likely to bolt than to stay. God speaks to us, like I speak to the hummingbirds and orioles (only with more love and concern), but we don’t realize that we are hearing a voice; or, if we do, that the voice is speaking to us. Unless something miraculous happens – some conspicuous movement of God – we pay the voice no mind. If we vaguely sense that something is moving toward us, we quickly retreat to a safe distance and settle back into our ambitions and distractions. The voice was God’s, but “The crowd that was there and heard it said it had thundered; others said an angel had spoken to him.” With varying degrees of spiritual insight, some recognized a voice in the unexpected sound but others did not. This also explains why, when God came to us, he did so by becoming one of us. St. John again: “The Word became flesh and made his dwelling among us.” Coming to us in his (super) natural self was out of the question. We undoubtedly would have tried to flee from him. Sometimes people ask why God does not show himself in order to convince the world that he exists. But it would do no good. The world is no more (and is probably far less) capable of accepting his appearance than the birds are of accepting mine. Our limitations limit his options. But not his love. This entry was posted in Christianity, Faith, Spiritual life, Theology and tagged bird feeder, finding God, hearing God, hummingbirds, incarnation, miraculous, orioles, spiritual insight. Bookmark the permalink.